I have been experimenting with a lot of hydroxy (a.k. a. Brown’s Gas) generator in my past. 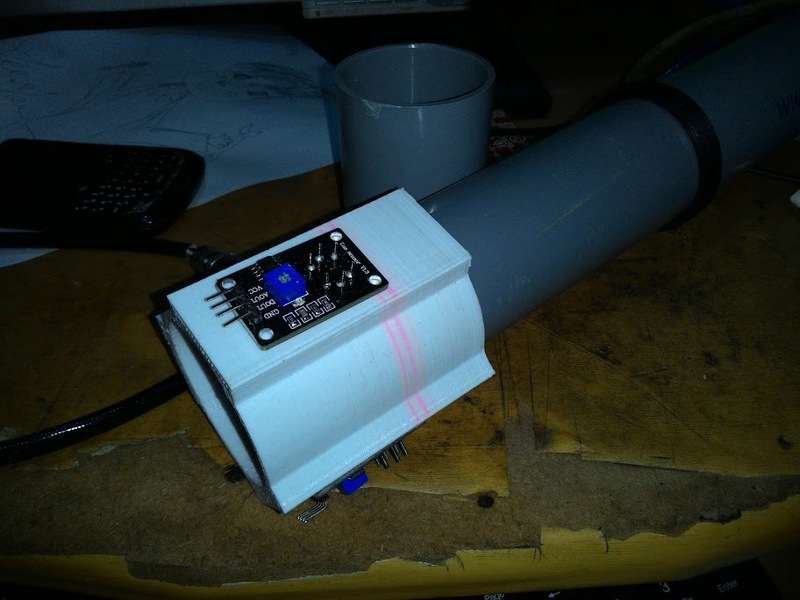 Back then, before I acquired a 3D printer, the only possible design was plate-based build, tubular designs are a little bit harder to build as at that moment of building it, I could not find a proper material to seal water leaks. The versatility of the printer motivates me to revisit my design. I sketched it using both SketchUp and 123D Design CAD program. I uploaded the stl file to Thingiverse to those who interested. Bear in mind the design are far from perfect. I sketch it just to stress-test my printer and the ABS filament. 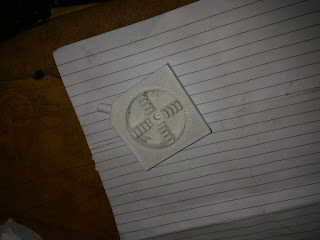 The print took around seven hours to complete. Unfortunately, all of my attempts failed. 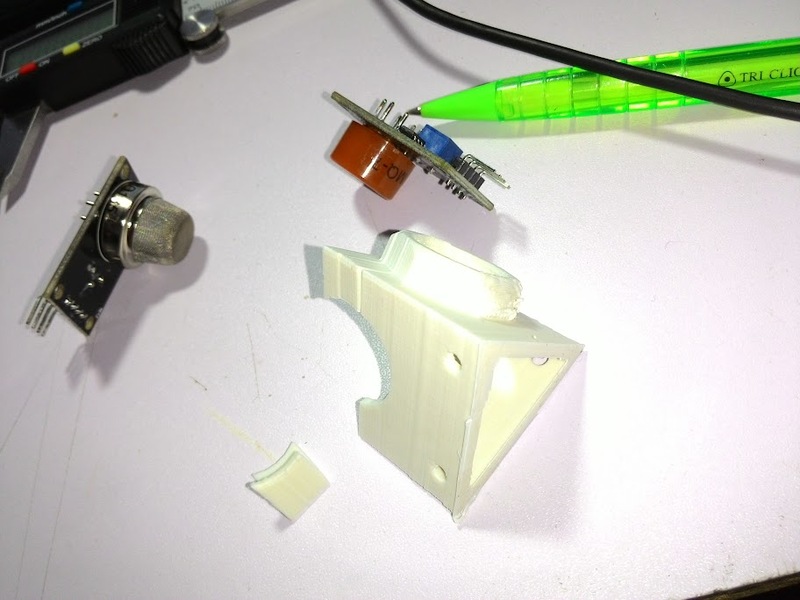 The failure includes broken spacers, dimension error, severe water leak and bad prints (especially bridges). 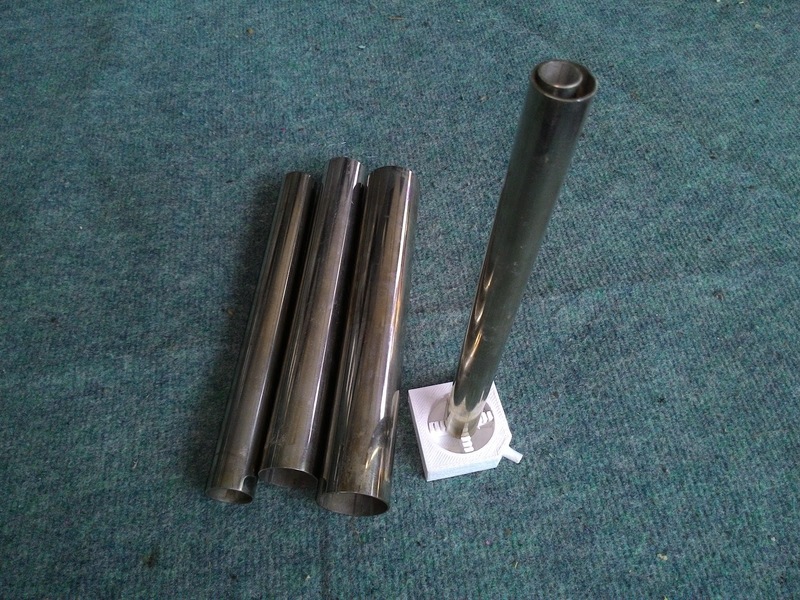 The first attempt was designed with a male-fitting so that a pipe could slide into it easily. 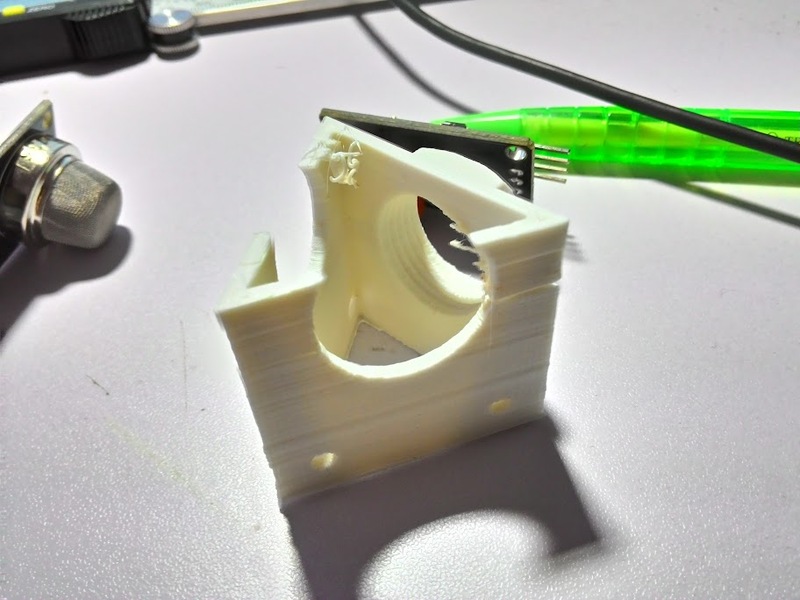 As visible in the pictures, the print failed as my settings are not optimized to print bridges. 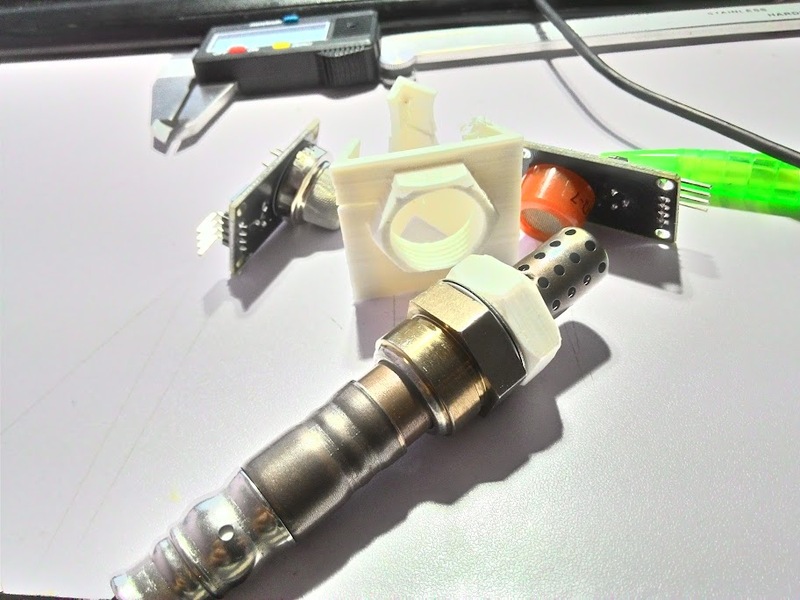 So I redesign it, this time, using BST threaded (awesome Nut Job Customizer from Thingiverse!) 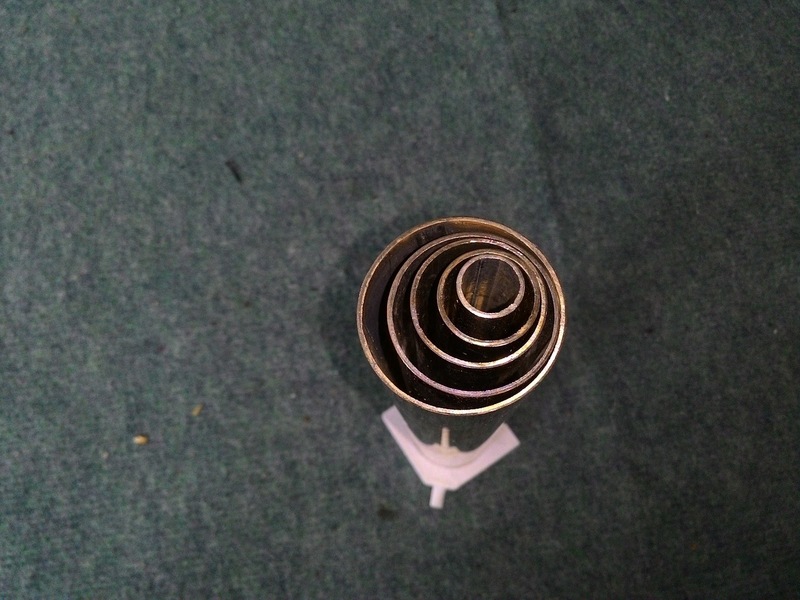 hole, to accommodate a typical water filter plastic fitting. 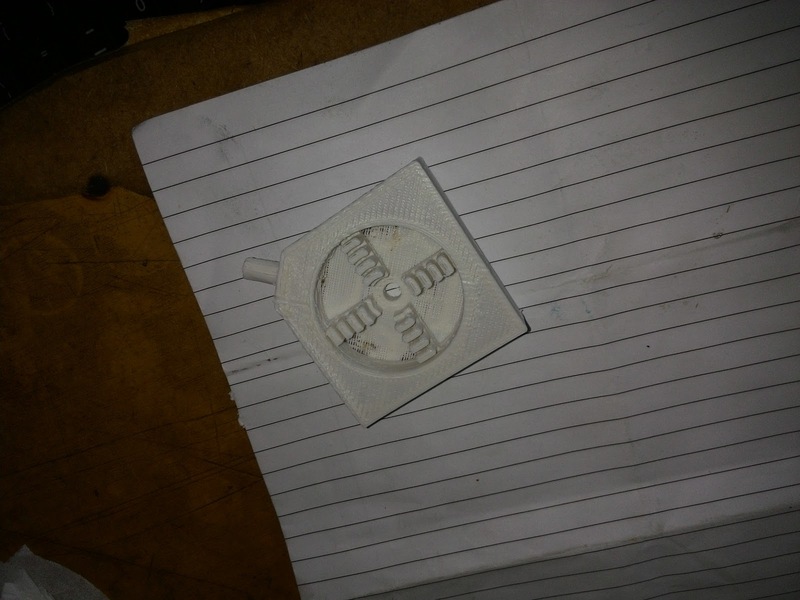 Again, even with print-support enabled, the printed thread is just not usable. 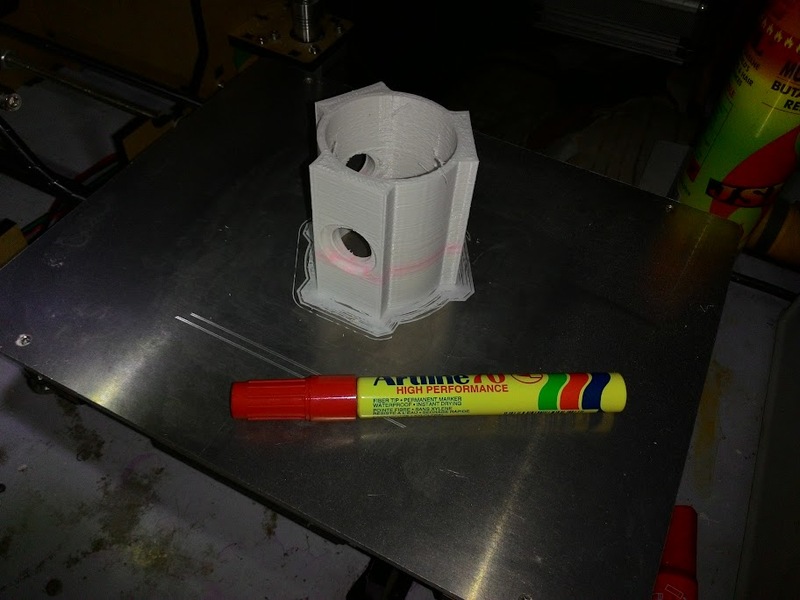 2nd design, with plastic fitting. The end cap with orange tube attached. 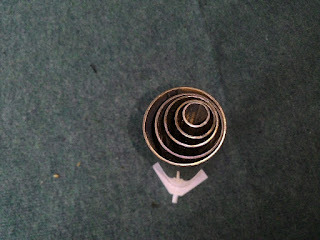 Top view: After all of the tubes assembled. 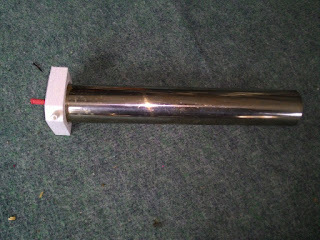 Side view: Notice the anode lead in red. 1st design, with printed exit tube on top left corner. On all of my prints, tube spacers are very fragile and can be easily broke in the z-direction. After tinkering with it long enough, I decided that it is my ABS filament being the culprit. My adventure stops here for now. 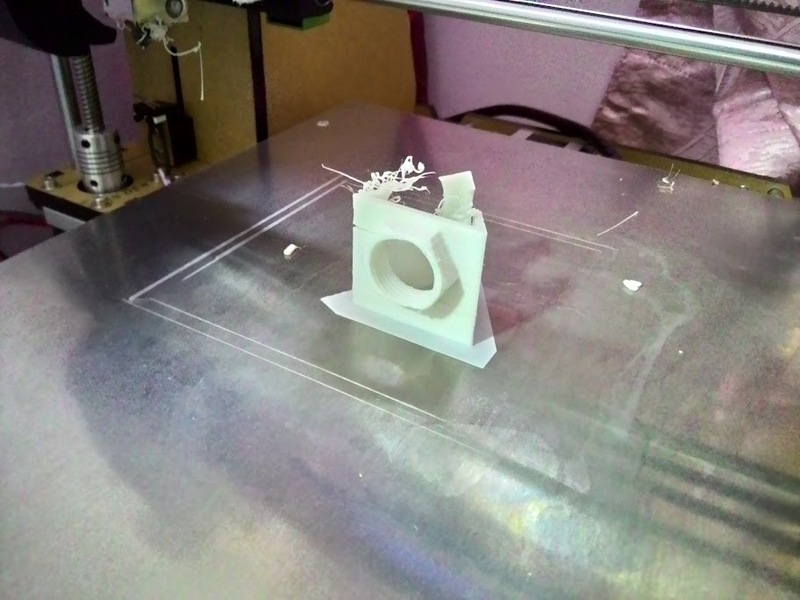 Printing with ABS is very challenging, even with heated bed used, the warping is inevitable. 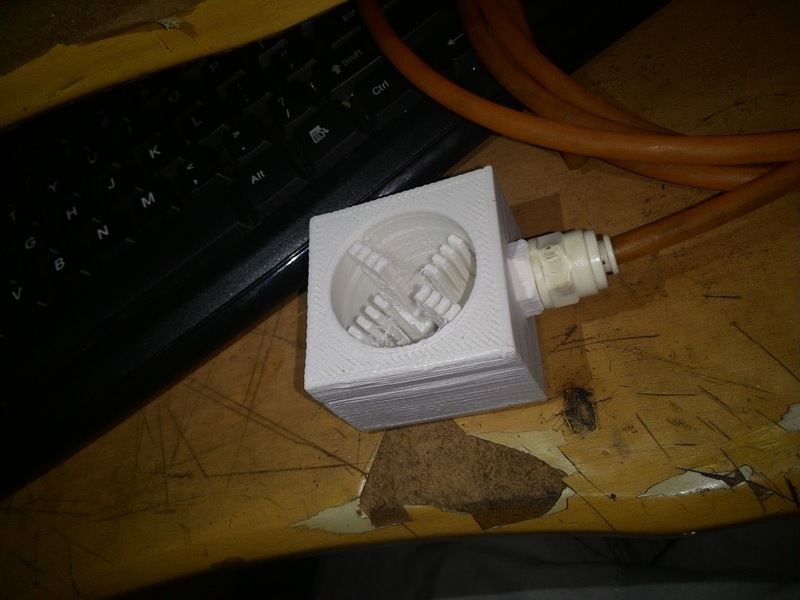 Not to mention my questionable ABS filament quality, the optimum extruder temperature is at 200 degree celcius, any higher will cause the surface finish to suffer and the print becomes brittle. I will revisit this in the future, this time, I might use a better quality PETG filament instead. I needed to test my colleague (Zhang Yifeng) 30W LED chip, he gave me a set of LiPo battery, an LED chip, and a heatsink - without the thermal paste. Just bear in mind that this is meant for temporary solution. Most toothpaste are a weak basic and it could potentially slowly etch aluminum surface. 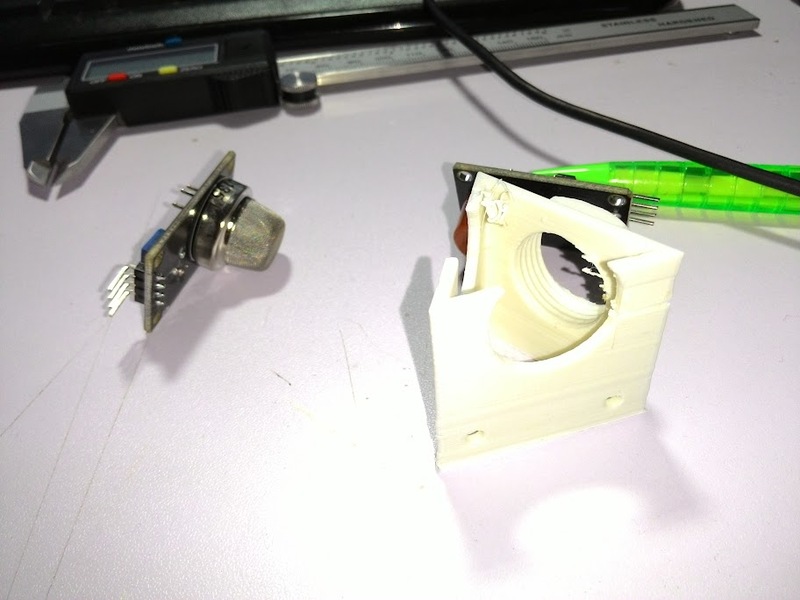 Better Filament Spool Holder for 3D Printer? 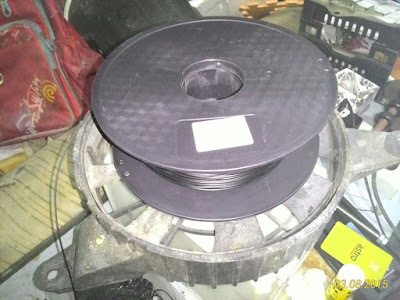 I 3d print a lot lately, and, I noticed that my current spool holder is giving too much friction that my extruder unable to handle it. This causes inconsistent extrusion width, which fails most of my print. While searching for a decent bearing to retrofit to my holder, I found a dead automotive radiator fan sitting in my junk box. I have done a lot of research and experiments on internal combustion engines (ICE) and most of them are themed for emission reduction and promoting better fuel economy. Until now, I have no way of knowing how effective my experiments are. Other than having to drive it for a week (to gauge fuel usage), I used to rely on my body senses (e.g. acceleration, smell, heat, noise, etc.) to approximate the results. This is of course not a reliable way of collecting data, not to mention that it might even get effected by placebo effect. Buying a commercial gas analyser is way beyond my budget. I finally constructed one for my own use. I use three gas sensors; carbon monoxide, hydrocarbon, and oxygen sensor. The fourth one is a simple thermometer. The link on where I got all this is listed at the end of this post. For the body, I sketch it using SketchUp, export the stl file, and printed on my FFF 3D-printer. The material of choice is ABS as PLA is too brittle for my purposes. 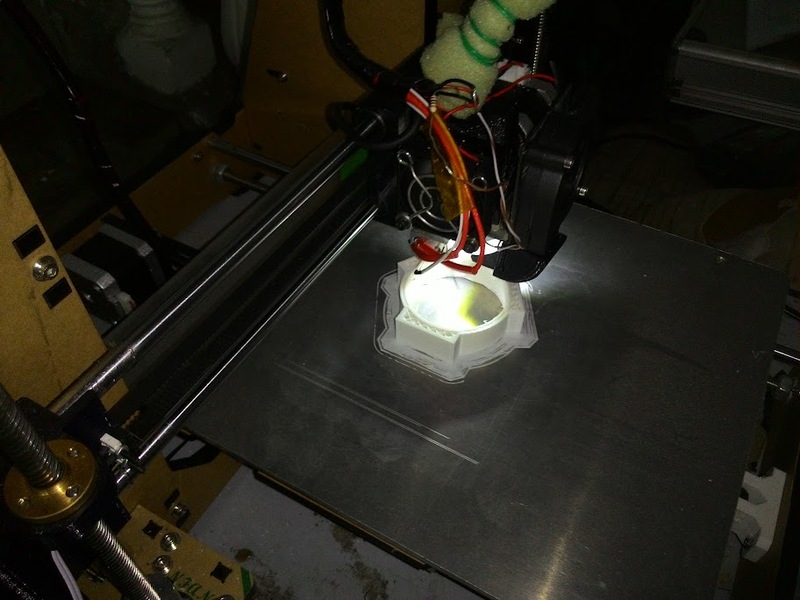 The print took six hours to complete with 200 microns of resolution. Since this will be operated at a relatively low pressure, for leak-free operation, I use hot-glue to secure all sensors. I design it so that it can be fitted with off-the-shelf PVC pipe. This allows more flexibility. 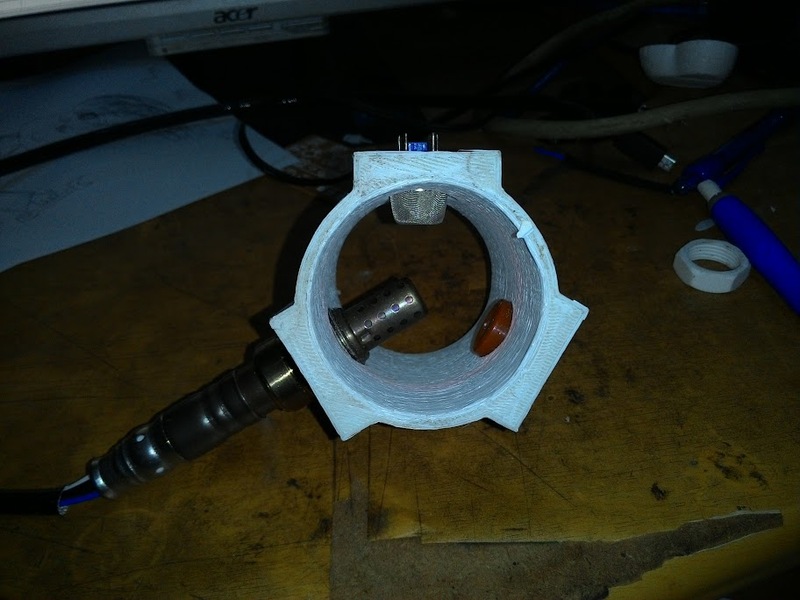 Each of the gas sensors are spatially separated by 120 degrees to give it an equal gas exposure. 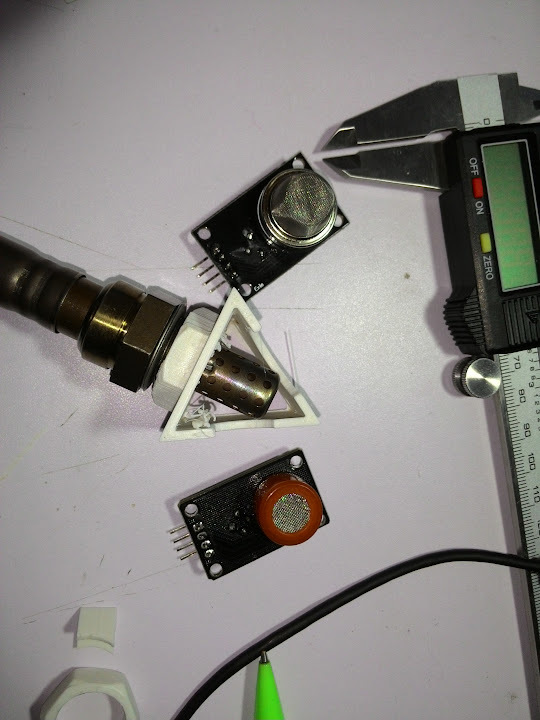 All of the sensor need to be preheated by at least five minutes prior usage. 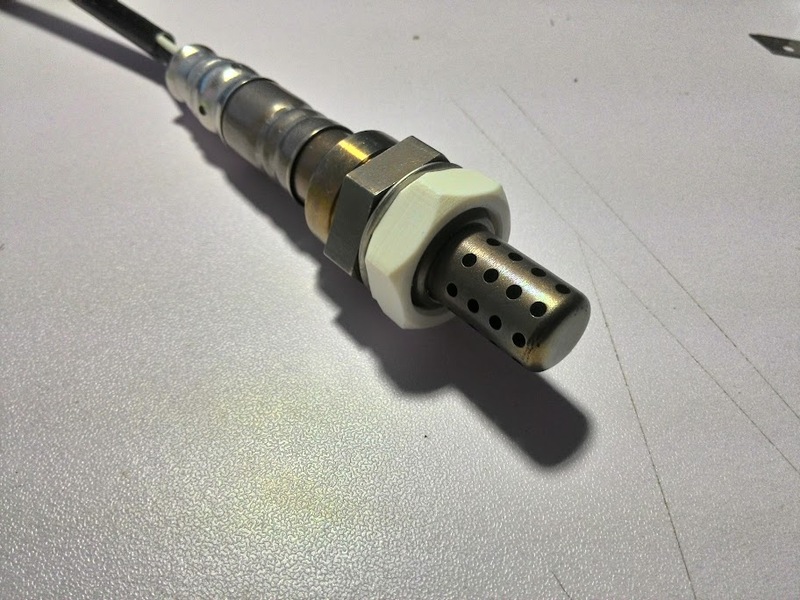 Oxygen sensor consumed most of the supply current. Total power consumption is just under 1A at 12V. I use an SMPS power adapter I found lying around on my table. 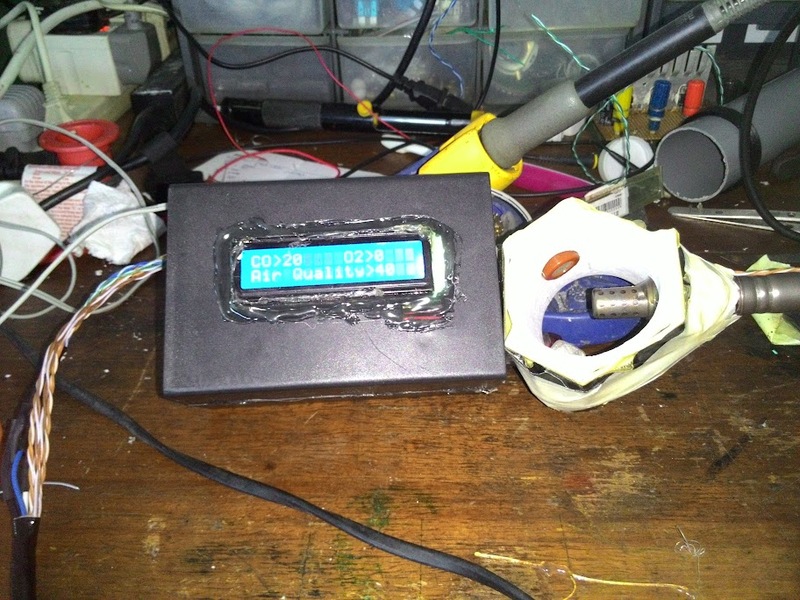 To display the readout, I use a cheap compatible arduino uno and a 1602 LCD enclosed in a laser cut jiffy box. 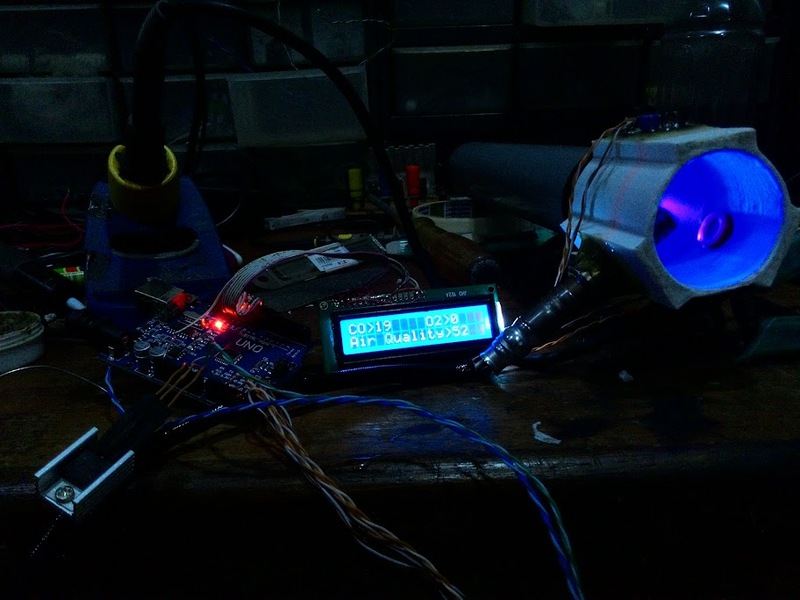 Using build-in library, the program is just a few ADC readings and LCD print function. I also included serial UART data transmission for easy data logging. 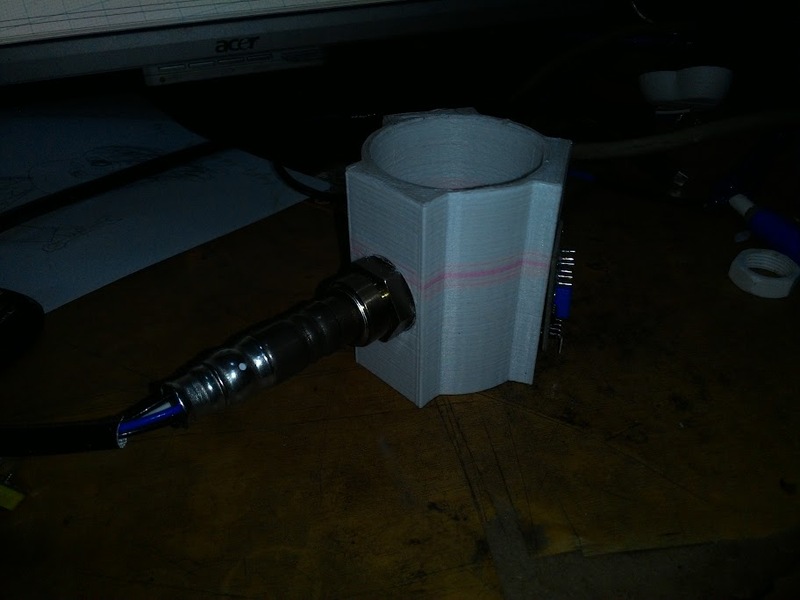 Testing 3d printed nut on my oxygen sensor. I had to stop printing as the warping getting worse over time. Close up: layer delamination and print warping. After some iteration, I manage to get a working model. This is my attempt of coloring my print using permanent marker. It turns out to be quite effective. Mounting all of the sensor. Enclosed in a jiffy box. 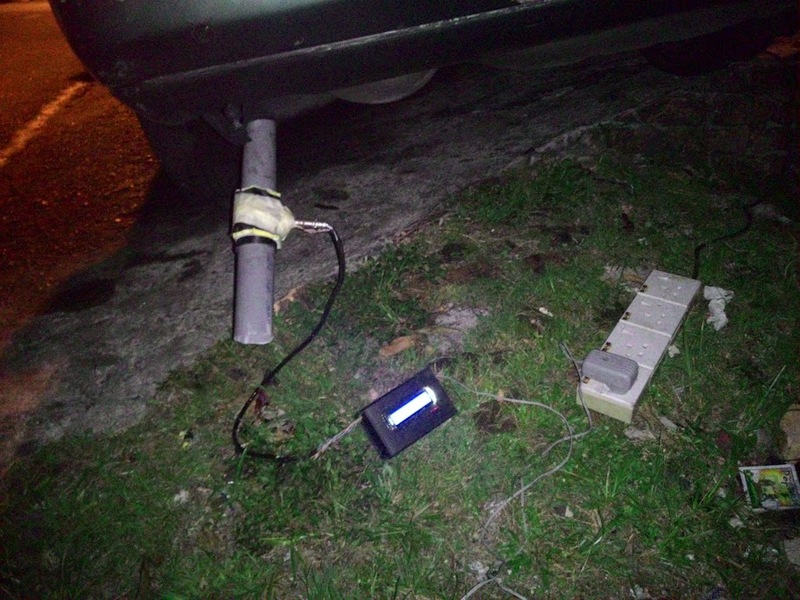 Tested on my dad’s diesel car. 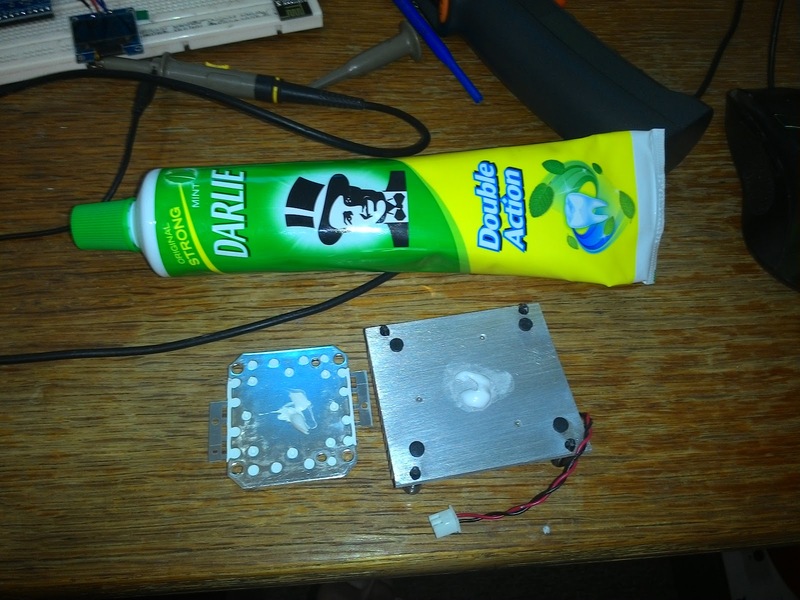 Utilising an arduino might be overkill for such a simple task. My only reason of using it is because it is cheaper to use compared to my DIY version of PIC MCUs board (that includes voltage regulators, external UART, reset button, etc.). The only way I can make my DIY PIC MCU dev board cheaper is to build it in large quantity, which is not really something that I want to dive into right now.